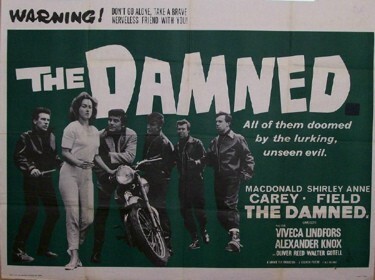 Well, when this weird movie came out, I was just a year old, its crappy and black and white but that’s what I love about the old B movies, suspense and thrillers, a few Rockers thrown in and there you go. 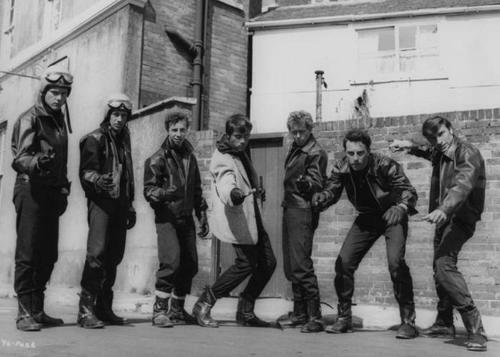 A totally weird movie, but just for the tacky music and the great motorcycles, clothing and old School England, brings back great memories for me. Dont take it for seriousness, its a mix of Juvenile delinquents, Social welfare, espionage, Government secrets, and science fiction all rolled into a small sandwich to get your teeth into. It may not be the best sandwich you ate but- you will sure remember it. LOL. Joseph Losey directed this unusual science fiction effort, which has won a small but fervent cult following. Simon Wells (MacDonald Carey) is an American visiting England, where he meets a woman named Joan (Shirley Ann Field). 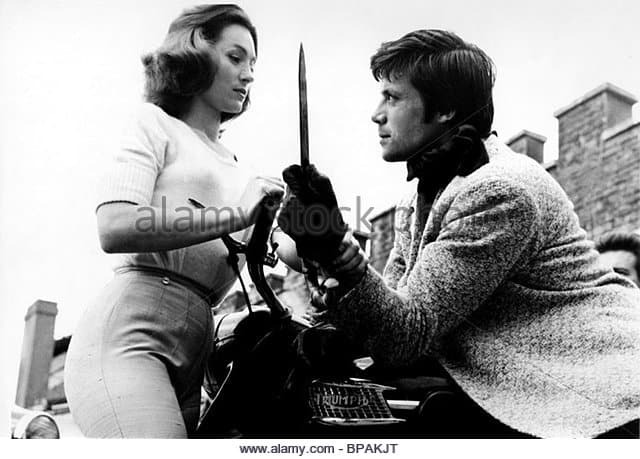 Simon is immediately attracted to Joan, but there’s a considerable obstacle in their budding romance: Joan’s brother King (Oliver Reed), the leader of a violent pack of motorcycle Rockers. King has a barely concealed incestuous attachment to his sister, and he sometimes uses her to lure victims into his gang’s clutches. King and his cronies attack Simon, take his money, and leave him stranded, where he’s eventually found by a pair of military security men. Simon is brought to the home of Bernard (Alexander Knox), a scientist working on a secret project for the government, and his girlfriend Freya (Viveca Lindfors), a sculptor. Joan eventually tracks Simon down in hopes of winning his forgiveness, but another run-in with King causes Simon and Joan to discover a cave that holds a terrible secret: a group of strange, cold-blooded children who were the products of one of Bernard’s experiments gone wrong. This is a film not often seen these days. I have the film and will show it to fellow 59 Club members on a film night to make it more fun. Here is the whole shooting match if you have time to atch, its slow but its history, a little like a cross between Clockwork orange and Rockers. 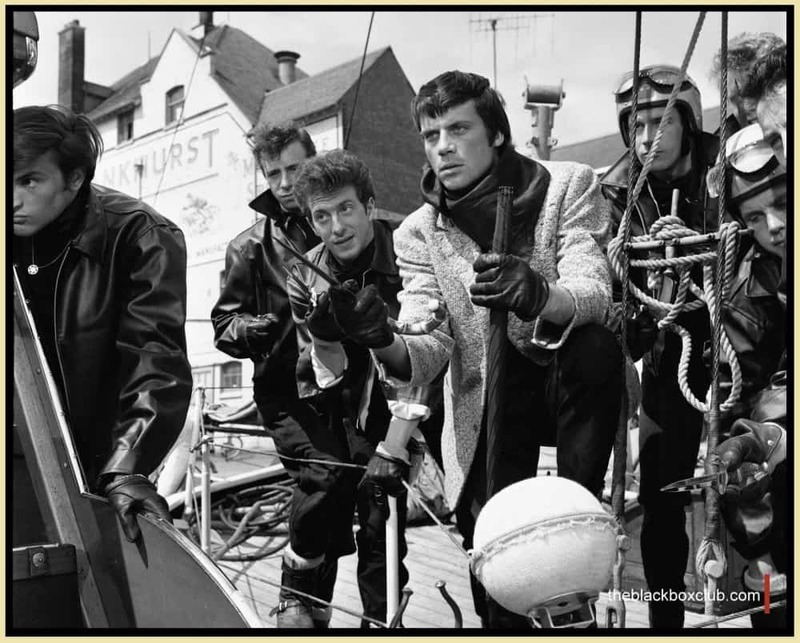 This entry was posted in Uncategorized and tagged 59 club, ace cafe, B movie 1963, beach bikers, Bike gang, black & white, brat, cafe racer, custom, cut throat, engineer boots, film noir, flick knives, hoodlums, Joseph losey, Juvenile delinquent, Oliver Reed, rock n roll, rockers, shirley ann field, The Damned, ton up, triumph, vintage. Orange Circle has their Annual Street Rod show.